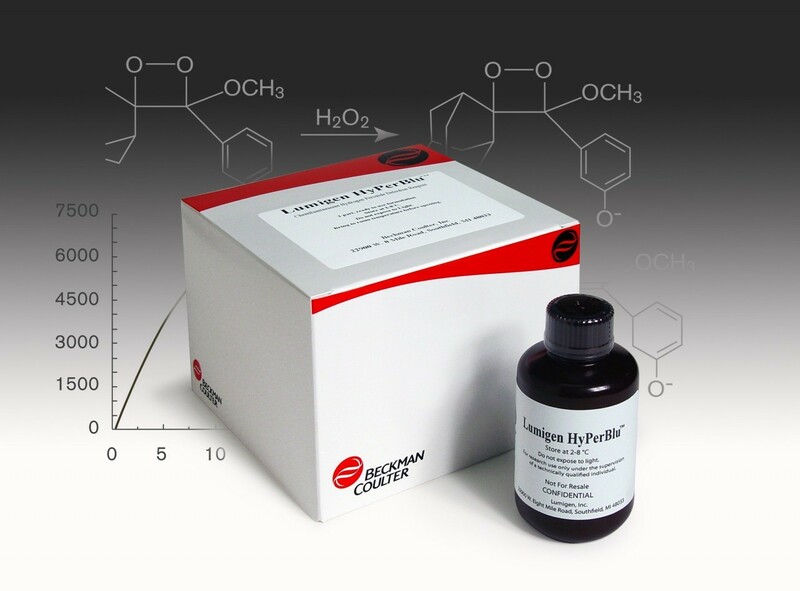 Lumigen HyPerBlu Chemiluminescent Reagent is a novel ready-to-use substrate for the direct detection of hydrogen peroxide. Reaction of the substrate with hydrogen peroxide rapidly generates sustained high-intensity luminescence for maximum detection sensitivity in solution assays. Coupled with oxidases the Lumigen HyPerBlu substrate also allows one step indirect quantitation of oxidase substrates or the oxidase itself. Lumigen HyPerBlu substrate is suitable for automation and miniaturization to 384-well or 1536-well format. Single ready-to-use reagent formulation with long stability for convenience. Broad dynamic range with bright sustained chemiluminescence. Excellent sensitivity in solution assays.